Former vice president and leader of the fledgling National People’s Party Joice Mujuru and other opposition chiefs who stayed away on Saturday from the launch of an electoral alliance which chose MDC leader Morgan Tsvangirai as its main man, say the grand coalition is not yet a done deal. This contrasts sharply with what Tsvangirai and other opposition leaders, who converged at the Zimbabwe Grounds, in front of other support groups, to sign and launch a coalition dubbed the MDC Alliance. On Saturday Tsvangirai signed a pact with former Finance minister Tendai Biti of People’s Democratic Party (PDP), Welshman Ncube (MDC), Jacob Ngarivhume (Transform Zimbabwe) and Zimbabwe People First (ZPF)’s Agrippa Mutambara, a retired army chief. As far as the larger sections of the opposition movement are concerned, this is the grand coalition that they have been waiting for and its leadership has been decided. Mujuru, who stayed away from the launch of the coalition on Saturday yesterday, however, told this paper talks to “form the coalition” where still ongoing. “What happened must be applauded because it shows the spirit of working together among progressive forces to achieve the ultimate goals of dislodging Zanu PF and Mugabe is still there. “Our negotiating team had engagements with the MDC last week and talks are ongoing. The only difference is the timing and as the NPP we believe that once we have concluded talks we will make an announcement once and for all. “Coalition talks are not an event, it’s a process of interrogating areas of common interest and those where there is divergence with a view to coming up with an agreement on all grey areas and that is what we are doing with the MDC and other parties,” Mujuru’s spokesperson, Gift Nyandoro told the Daily News. Former Finance minister and leader of Mavambo/Kusile/Dawn (MKD), Simba Makoni, said he had not been invited to Saturday’s historic event, adding that he was surprised that Tsvangirai and others had launched an alliance without other parties such as his. “We were not invited to that coalition and we could not have gate-crashed the event. Besides we already have a coalition in the form of the Coalition of Democrats (Code) to which we invited them but turned us down saying they were not ready at the time. “We expected that they would come back to us to tell us that they are now ready for a coalition and we surely would have come together because that is what we set out to do when we came up with Code two years ago. However, they never gave us an opportunity to be part of them,” Makoni said. Zapu president Dumiso Dabengwa cast doubts about joining Tsvangirai in the coalition. “Did you want us to dump our parties to join an MDC alliance when we do not even know what they are up to and what their strategy is? “We formed a coalition, Code, and invited everybody and they turned us down so what do we do. They decided to form their own coalition so should we also jump ship and join them? We are not MDC. “I suppose it is possible that we can come together, talk and come up with another coalition but I don’t see us joining the MDC coalition,” Dabengwa. They all took turns to endorse Tsvangirai as their candidate to take on Mugabe in the much-anticipated plebiscite. In his keynote address, Tsvangirai said he personally brokered the peace deal with his two estranged former secretaries-general, Ncube and Biti. Ncube broke ranks with Tsvangirai in 2005 following an acrimonious disagreement over the party’s participation in that year’s senatorial elections while Biti left the MDC in 2014, a few months after the party suffered a thorough hiding during the previous year’s elections. Analysts had repeatedly said a coalition involving Tsvangirai and Mujuru would present a formidable challenge to Mugabe and his quarrelling colleagues next year considering that the widow of the late decorated liberation icon — Solomon Rex —possessed strong liberation credentials and intimate know-how of Zanu PF’s election mischief. Mujuru’s absence left many wondering whether she would oppose the coalition and go it alone or join hands with Dabengwa, Makoni and Mangoma in the Code. 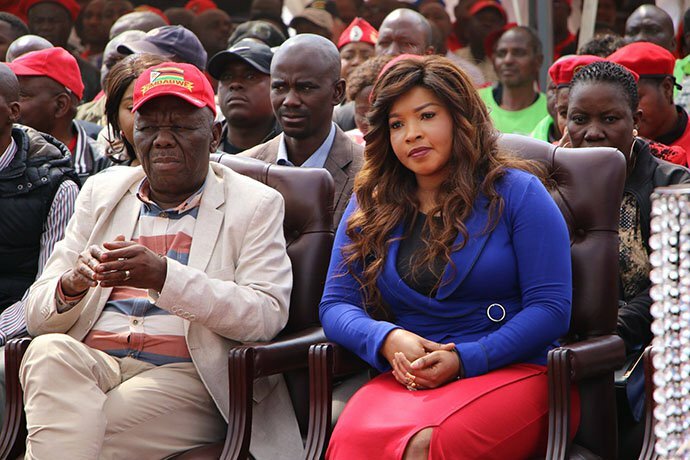 Tsvangirai expressed hope that Mujuru and others would soon be joining the “big tent” despite the fact that the MDC Alliance is already portioning constituencies amongst themselves. The duo signed a memorandum of agreement (MOU) in May, which lifted the mood of thousands of ordinary Zimbabweans looking for an alternative to Mugabe and Zanu PF. Analysts yesterday said the coalition still needed the likes of Mujuru and Dabengwa as they were still vital in the opposition’s quest to defeat Mugabe and Zanu PF. “The MDC Alliance is an important step in the right direction towards a grand coalition, but it is not enough. “There are unique electoral benefits that remain missing that Mujuru, Dabengwa, and Makoni would bring to the grand coalition hence the need for continued engagement towards a game- changing and formidable grand coalition. “Beyond a coalition, the most important thing to focus on is electoral reforms to level the electoral field. If the opposition fails to secure electoral reforms then they must ensure they have the tools and mechanisms to monitor, track, and expose electoral rigging for the world to see and be convinced beyond a shadow of doubt. It has proven difficult to demonstrate that the 2013 elections were rigged in the absence of hard evidence to back up those claims,” said rights and political expert, Dewa Mavhinga.